National Weather Service map shows forecast rain totals on Christmas Day. 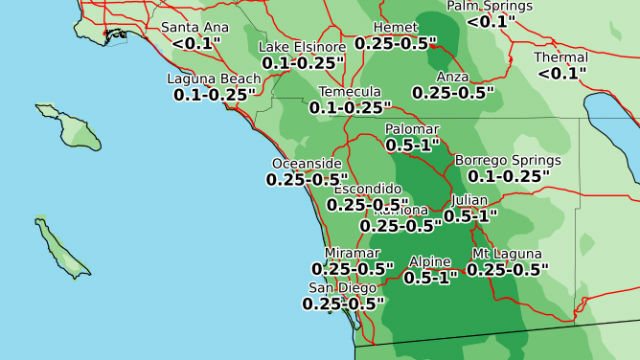 A fast-moving Pacific storm is on track to hit San Diego on Christmas Day, with up to half an inch of rain in most areas and snow above 5,000 feet. The storm will be accompanied by gusty winds, especially through the mountain passes and along the desert slopes. Boaters will face winds of up to 35 knots offshore. As the storm approaches, patchy dense fog will cover coastal areas on Sunday night.